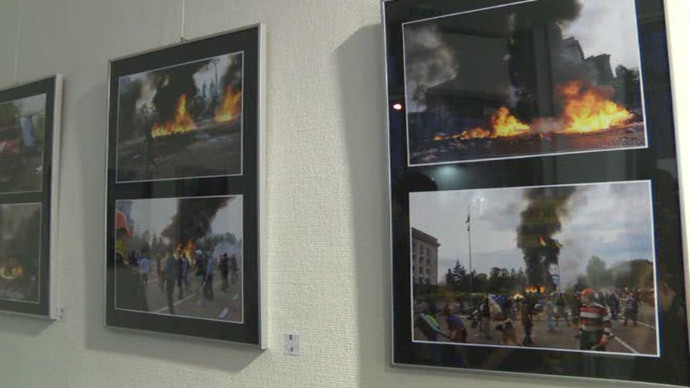 Survivors of the bloody Odessa May 2 clashes and subsequent tragedy at Trade Union House, where nearly 50 people were burnt alive, have organized international photo exhibits in order to convey the events with a new clarity denied to viewers by Kiev. Violent clashes erupted on May 2 between rival rallies of anti-government protesters and radicals supporting the coup-imposed Kiev government. 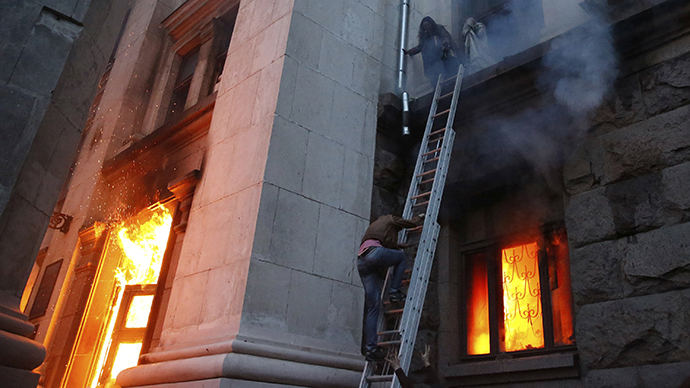 The confrontation led to a tragedy that left 48 people dead and 247 injured, as nationalists burnt the protester camp and then set fire to Trade Unions House with anti-Kiev activists trapped inside. The actual death toll could be much higher, as many of those who managed to escape the flames were then either strangled or beaten with bats by radicals, according to witness reports. 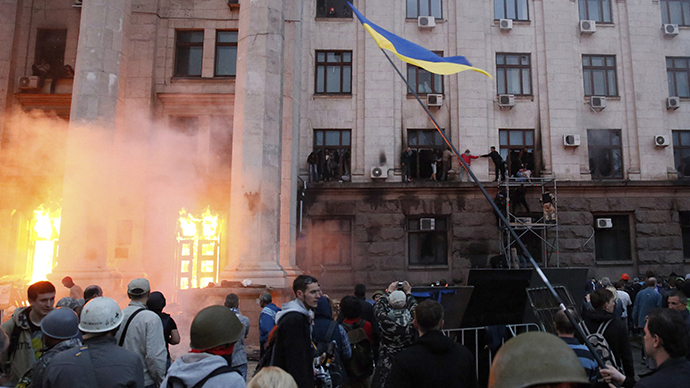 After the slaughter, a media blockade was imposed by Kiev, supplemented by an unwillingness to investigate the events in an objective, dispassionate manner. 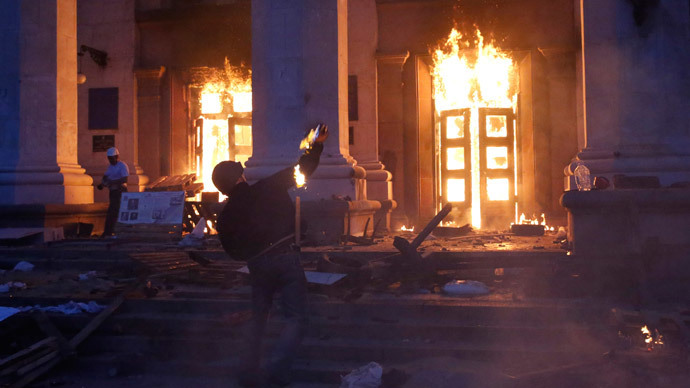 The most popular version of events in the Ukrainian media at the time stated that members of the anti-Kiev uprising set the Trade Union House on fire themselves, while the neo-fascist elements of the Maidan uprising were presented as victims of savagery. In order to present the May 2 events in a manner that only a witness and a survivor could, two members of the Rodina (Motherland) group have formed a coalition called ‘Remember Odessa, Stop Fascism’. Sergey Marchel and Oleg Muzyka contacted a number of European anti-fascist groups for the purpose of setting up a photo and video diary of what had gone down during the fire and the subsequent storming of the Fourth Regional Department of Internal Affairs in order to free the remaining anti-Maidan prisoners. The resulting exhibition was presented to the European public throughout the early summer, and has gained widespread popularity. The Berlin exhibit saw the biggest crowds, its ZDF and ARD networks covering the event, which consisted of over 50 photographs made by witnesses of the Odessa events. 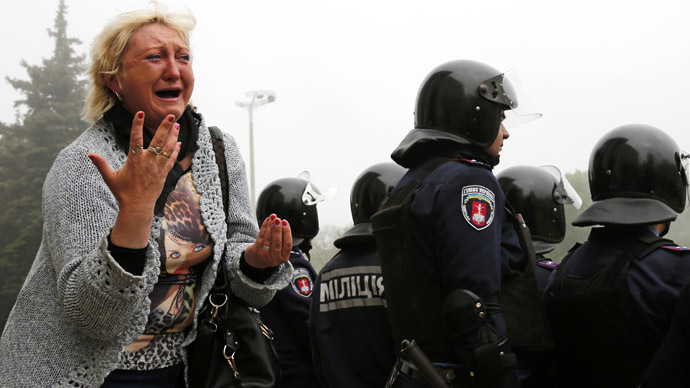 “The events of May 2, 2014, on Odessa’s Koulikov Field must not be forgotten. And those among us who were spared must do everything in our power to ensure that our friends and close ones’ deaths were not in vain,” Muzyka said addressing the press and visitors. “Eyewitnesses have traveled together with this exhibition, so that the spectators could get a first-hand account of how things went down… unarmed people were burnt alive in what was a pre-planned action,” Marchel said. The show has been a big success, visited by journalists, public figures – even politicians. The creators are especially pleased with the effect the show had on the guests. It could clearly be seen that the guests were moved by scenes they had not imagined could take place in the heart of Europe. Muzyka recalls his own surprise at having to answer some of the questions posed about the earlier events of Maidan Square, and believes this to be evidence of the style of coverage given to them by European media. Some of the visitors showed naivety in asking Muzyka and Marchel “why some Ukrainians disagreed with the Kiev government… or why we refused to abandon the Trade Union House” and so on, Muzyka said. The exhibit has taken in Germany, Belgium, Spain, Serbia, Bulgaria, Romania, the Czech Republic, Poland, Hungary, Slovenia, the United Kingdom, India – and is coming to Ireland later in August.